The chances are pretty good that someday you may have to wear glasses. That’s right, three out of four people will require vision correction at some point in their lives. It makes sense. When you factor in the number of people who are born with poor vision and the fact that as we age, we lose our focus flexibility. With 20/20 vision, we can see the stop signs, recognize friends across the street and read the menu on the wall at your favorite sandwich shop. But there is one small problem. Just how does one go about picking out a pair of glasses? Well, we are here to help. 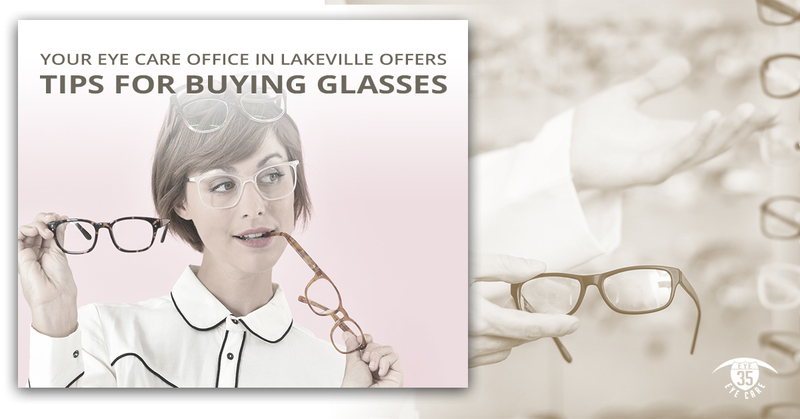 Eye 35 Eye Care, your eye care office on Lakeville, offers tips on how to select a pair of glasses. The human face can be categorized to fit one of several generic shapes. 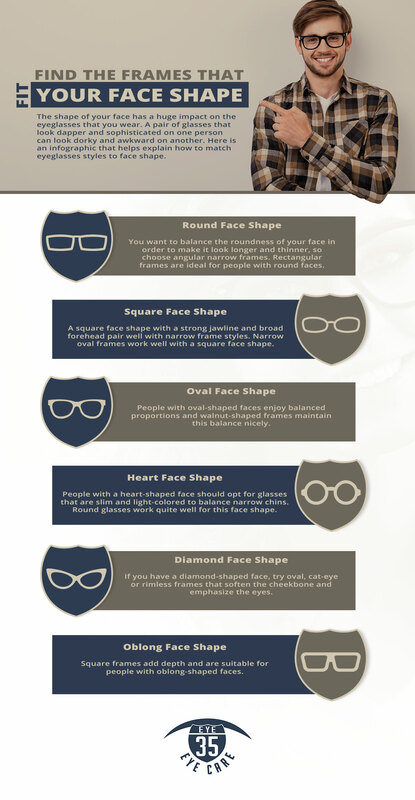 For example, a person with a round face should select a pair of glasses that are rectangular in shape. The rectangular shape of the glasses will elongate the face. Someone with a square face will want to avoid rectangular-shaped glasses, it makes them too square looking. A pair of round glasses will soften the face by contrasting the stark angles of your face. A heart-shaped face is characterized by strong cheekbones, a narrow chin and a larger forehead. You will want to find a pair of glasses with a wider top than bottom to create a nice contrast. If you have an oval face, congratulations, you can rock just about any style of glasses. Discover your personal style and pick a pair of glasses that fits it. For example, if you are a student, perhaps you should pick a pair of glasses that has an eye-catching shape. Maybe you want a pair of glasses that has a bold color or some funky design on them. You might even want to go with a geeky look if that suits you. If you are a professional, you might opt for something modern, such as a geometric design with metallic frames. You can choose a blue, green or even a blue frame. You would also look very sharp in a vintage style pair of glasses; very classy. For the serious business person, stick with something black and conservative. If you are a busy parent, you have no concern about what is stylish, you just want a pair of glasses that are basic and durable. No matter how wonderful you look in your new glasses, you will be miserable if they don’t properly fit. Your primary concern should be how well your glasses fit. If you already own a pair of glasses that properly fit, check the measurements on the inside of the arm of the frame. If not, have your eye doctor measure your eye size, bridge size and temple size so you can get glasses that fit. If you are having a difficult time reading the menu board at your favorite sandwich shop, give Eye 35 Eye Care a call.